The young tigress Sakhti that used to be the lucky charm of the TSUM mall will impress the citizens of Plovdiv after the New Year, the Plovdiv businessman Georgi Gergov, owner of the mall, explained. 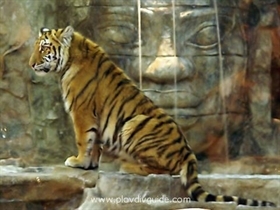 He has already discussed it with the Plovdiv Mayor, Dr Chomakov, the tigress to find its new home in the Plovdiv Zoo. Mr Gergov is eager to invest in the reconstruction of the quite old Zoo so that to make it comfortable for his favorite Sakhti. Now the glass cage of the TSUM mall will host a black panther….